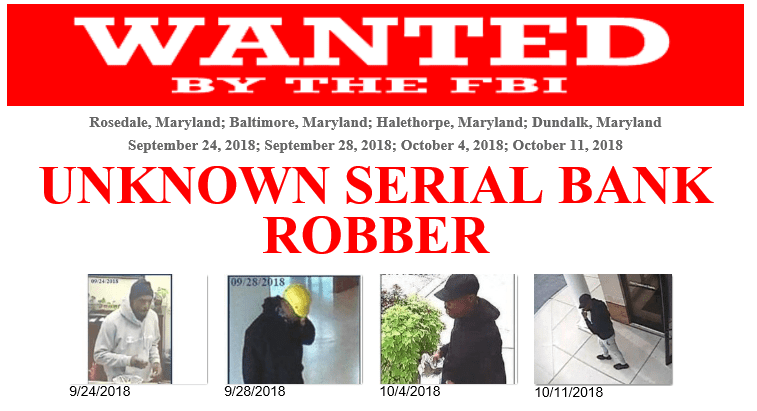 The Federal Bureau of Investigation is offering a reward for information leading to the capture of the man responsible for several bank robberies in the Rosedale area and throughout Baltimore County. On September 24, 2018, the suspect wore a gray “CHAMPION” hoodie, blue jeans and black and white shoes. On September 28, the suspect wore a black hoodie, black gym pants with stripes down the side, yellow hard hat and dark-colored bandana around his neck. On October 4, 2018, the suspect wore a black hoodie, blue jeans, black boots, and a black baseball hat. On October 11, 2018, the suspect wore a black hoodie, grey tapered sweatpants, black baseball hat, black bandana and a black baseball hat. The FBI is offering a reward up to $5,000 for information concerning these robberies. This man should be considered armed & dangerous. 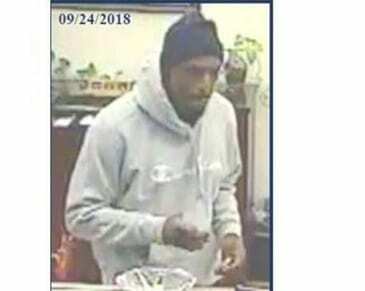 Anyone with information is asked to contact the Baltimore Office of the FBI at (410) 265-8080 .